It began life as a low-key riff on Point Break exactly 15 years ago and now, Universal’s Fast and Furious juggernaut is a franchise that is ostensibly one of the biggest in the business. 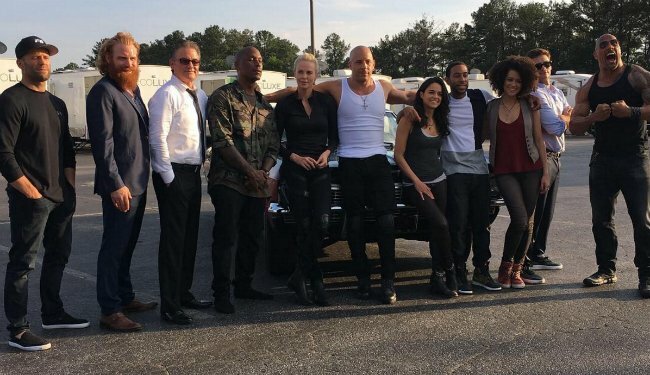 Hoping to uphold tradition in early 2017 is F. Gary Gray’s Fast 8, the first entry in a planned trilogy of movies that will culminate with the release of Fast and Furious 10 – yes, 10 – in 2021. But long before Universal retires its car-racing flagship for the time being, the Toretto crew will be assembled for another globetrotting affair, and series stalwart Vin Diesel has offered fans a peek of that ensemble via Instagram. Bringing together old faces and new – everyone from Dwayne Johnson to Charlize Theron’s franchise newcomer Cipher are featured in the snap – perhaps more than anything, the still is a neat reminder of Fast 8‘s star-studded cast. After lensing across Iceland and Cuba, Gray’s sequel is nearing the end of principal photography, as it plans to drift into a lengthy post-production process to bring those signature, eye-popping action sequences to life. Among the family anchoring that on-screen chaos is Diesel, Johnson and Theron, who will be joined by Michelle Rodriguez, Lucas Black – returning to the franchise for the first time since Tokyo Drift – Tyrese Gibson, Ludacris, Scott Eastwood, Kristofer Hivju, Nathalie Emmanuel and Kurt Russell as the mysterious Mr. Nobody. Expect Fast 8 to race into theaters on April 14, 2017. Nipping at the heels of Gray’s maiden entry in the franchise are Fast & Furious 9 and Fast & Furious 10 across April 19, 2019 and April 2, 2021, respectively.